Everybody who encounters children involved into musical activity would agree that these children are different form their peers. The differences are even more noticeable in context of cultural crisis of nowadays. 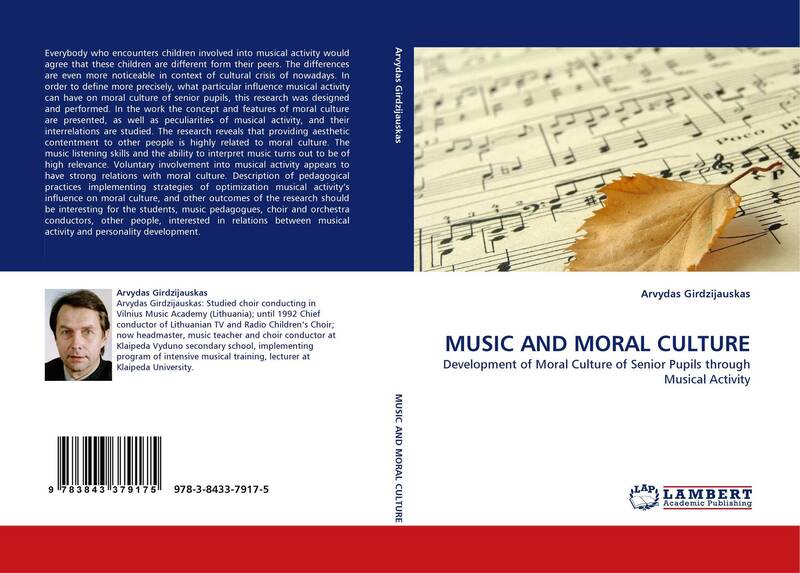 In order to define more precisely, what particular influence musical activity can have on moral culture of senior pupils, this research was designed and performed. In the work the concept and features of moral culture are presented, as well as peculiarities of musical activity, and their interrelations are studied. The research reveals that providing aesthetic contentment to other people is highly related to moral culture. The music listening skills and the ability to interpret music turns out to be of high relevance. Voluntary involvement into musical activity appears to have strong relations with moral culture. Description of pedagogical practices implementing strategies of optimization musical activity's influence on moral culture, and other outcomes of the research should be interesting for the students, music pedagogues, choir and orchestra conductors, other people, interested in relations between musical activity and personality development.